About A Power Company we provide business electricity and natural gas to homes and business, find utility auditing service here. “We are the nation’s leading consulting firm with the expertise and vision to deliver bottom line results — We know how to translate costs directly into profits bringing quantifiable value to your company.” President, A Power Company. A Power Company was Established in 2011 and headquartered in Farmington, Connecticut, A Power Company has years of experience and expertise that have delivered measurable results for our clients in many industries. Our proven methodologies combined with the most comprehensive profit improvement and risk mitigation services in the industry sets us apart from any other consulting firm. A Power Company success at achieving results for our clients is due to our unique team of professionals that includes consultants, operations experts and program management specialists with years of direct industry experience. Our experts are former employees of companies in their area of expertise that now use their “insider knowledge” to the benefit of A Power Company clients. Using A Power Company proprietary technology and database systems, our industry experts, who are well versed in unique pricing matrices, custom quotes and best practices, have a leading edge to provide our clients the highest levels of recoveries, cost improvement and risk mitigation services in the industry. 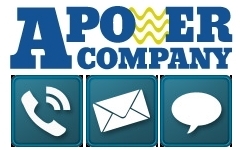 Discover A Power Company’ profit improvement and risk management solutions for your company.